We are pleased to announce the release of issue 4, our Autumn issue, focusing on Telehealth. The Innov-age team are looking at telehealth technologies and services that have been subjected to rigorous evaluation and some useful insights into the breadth of future telehealth opportunities. Dr Chris Mimnagh, a practicing GP and Director of Strategy for Liverpool Health Partners, discusses current telehealth solutions, his experience, and the possible future impact of telehealth on a generation for whom technology has become routine. Dr Iracema Leroi, Clinical Senior Lecturer in the Institute of Brain, Behaviour and Mental Health at the University of Manchester, gives an overview of the SAMS project (software architecture for self-monitoring of cognitive symptoms in elderly computer users) and explains how daily computer use might flag up the need for a memory assessment. Dr Clive Savory, a Senior Lecturer in Technology Management at The Open University, discusses what issues you need to be aware of if you are involved in a new implementation of telehealth, either as a health professional or as a manager of a service. 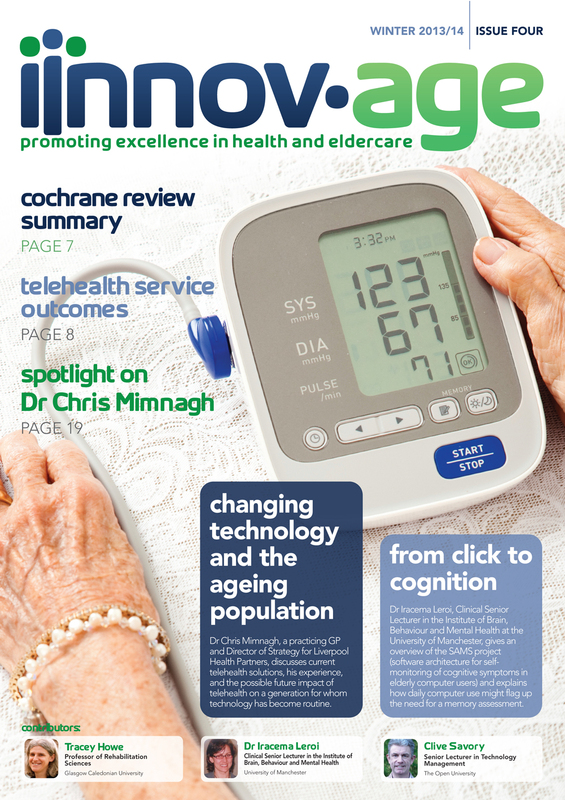 Each issue of Innov-age features articles written by leading professionals from both within and outside the NHS, sharing best practice and innovation, helping to improve the care and safety of older people. For further information and news please visit www.innov-age.org.